Why is circuit performance important? When choosing circuits you need to consider the sophistication of the ventilator you are using and the objectives of your therapy, whether it is low flow anesthesia in theatres or weaning a patient from ventilation in ICU. With the introduction of circle circuits and the development of the anesthesia machines, the art of Low Flow Anesthesia has become more widely used with many advantages. Low Flow Anesthesia consists of using low flows of anesthetic gases, so instead of using the typical 6-8 lpm + (which also includes a lot of wastage, and resistance through the circuit, if corrugated), the flows are normally between 1-2 lpm. low cost (up to 75% reduction in cost), less wastage. Most modern ventilators have sophisticated patient breath recognition and triggering systems. These require circuits that compliment the ventilator rather than hinder it. High flows of gas are also often used to overcome patients peak flow demands. In terms of circuits there are two main considerations: flow resistance and the compliance of the circuit. A typical corrugated circuit creates resistance as the flow of gas moves through it. The corrugated surface creates turbulence (see diagram below) and this creates resistance. Furthermore, the more flow you give your patient, the more resistance created and the more you will compromise your ventilator and therapy. Add a heated wire and you will also increase resistance. DEAS smoothbore circuits are glass smooth on the inside and therefore flow is relatively unhindered. 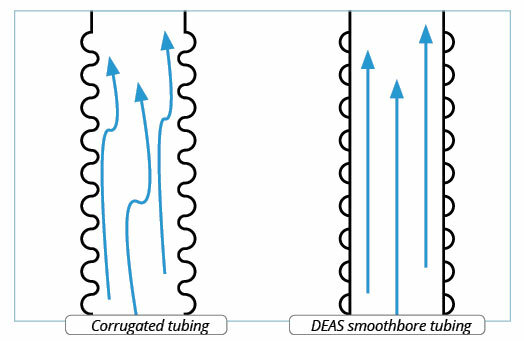 The diagram demonstrates the significant resistance differences between a DEAS smoothbore circuit and a traditional corrugated circuit. 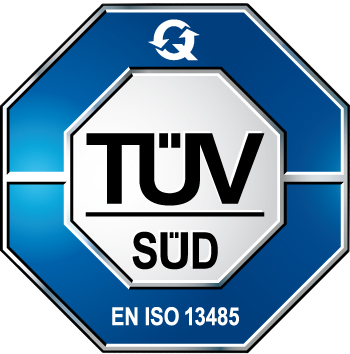 In terms of circuit design compliance is the amount of strength within the circuit walls when exposed to flow and pressure. The more stretch within a circuit, the more volume will be required to fill it (important in low flow anesthesia) and the more the ventilator will have to work to achieve inspiratory pressures.